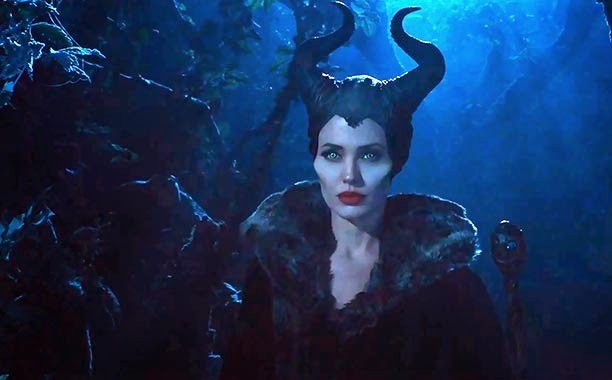 “I hate children!” Angelina Jolie yells in the guise of the iconic villainess Maleficent, perhaps the most iconic villainess ever in the world of Disney. This declaration is amusingly believable, despite the fact that Jolie and hubby Brad Pitt have a brood of both biological and adopted children in real life, but almost nothing else is in this live-action prequel of sorts to the 1959 animated milestone SLEEPING BEAUTY. The idea here is that Maleficent had her reasons for her wicked wrongdoings, such as cursing a newborn baby to fall into an eternal sleep on her 16th birthday. You see, as a young faerie living in the magical realm known as The Moors, she was once in love with the baby’s father, Stefan, when they were young and played by Isobelle Molloy and Michael Higgins respectively. After they grow into up into the form of Jolie and Sharlto Copley, Stefan betrays Malificent by drugging her and stealing her wings – cutting them off with iron, which is like Kryptonite to the faeries – in order to become king of the human realm. So the curse upon Stefan’s daughter Aurora (played as child by both Jolie’s own offspring Vivienne Jolie-Pitt and Eleanor Worthington Cox; then as a teen by Elle Fanning) is purely an act of revenge because you know what they say about Hell having no fury like a woman scorned. Sorting out this mythical mess will involve Malificent’s right-hand man Sam Riley as a shapeshifter, who can become anything from a crow to a ginormous fire-breathing dragon; the chatty comic relief of three floating pixies (Imelda Staunton, Juno Temple, and Lesley Manville), and a wannabe epic battle with Stefan’s faceless army of armored soldiers. The premise of giving a classic character an elaborate back story explaining how their role in a classic tale came to be brings to mind last years’s OZ THE GREAT AND POWERFUL, so it’s no surprise that MALIFICENT is directed by that film’s production designer, Robert Stromberg making his directorial debut. Stromberg, whose work on James Cameron’s AVATAR and Tim Burton’s ALICE IN WONDERLAND won him Oscars, has a sweeping visual style and flair for creating otherworldy terrains, but all of his previous conceptual designs appear to blend together into this one. The result is a lavishly generic CGI-ed landscape that could be in any number of fantasy films over the last decade. This all too familiar artificial atmosphere renders Jolie as just another special effect. With her face saturated in white make-up on top of scary cheekbone prosthetics, Jolie looks like a pristine porcelain doll, or worse like a dolled up mannequin posed and re-posed for stop-motion sequences. At least she doesn’t strike a pose with her hand on hip, while her bare right leg juts out of her dress like on the Oscars a few years back. But then maybe that would make up a little for the film’s lack of genuine humor. Jolie does display moments of impassioned emotion – like when she’s screaming to the Heavens after having her wings clipped - but overall her icy, intense commitment to embodying the Mistress of Evil doesn’t help get across the heart and soul that screenwriter Linda Woolverton (THE LION KING, ALICE IN WONDERLAND) is going for. It may be possible that MALEFICENT didn’t appeal to me because neither the original fairy tale, whether it was Charles Perrault’s or the Brother Grimm’s version, nor the Disney movie adaptation have never appealed to me. So, of course, the prospect of the story being told from another perspective would have little allure. SLEEPING BEAUTY fans may rejoice in Jolie’s performance, and find the revisionism refreshing, but this non-fan found it to be a dark, drab, and tediously draggy re-imagining that has no imagination of its own.